Wow the world created in The Glass Arrow is both riveting and terrifying. I found the girls at the Garden all interesting because they were all at different levels. Aya is someone who has had freedom and therefore knows what she is missing. The other girls who were born into it hanging over their heads have different levels of acceptance. Each reacting differently to being bought and sold. I was glad that Kristen showed this dynamic. I felt like it was important. The Drivers remind me of Gypsys. They have their own secret society that is looked down upon by everyone else in society. Seriously people who sell girls look down on them. I don’t consider that much of an insult. Aya is a very strong character but she come from the wilds where she has lived free. She doesn’t understand the concept of living any other way. She considers it a death sentence. She is hot tempered and sometimes that can be irritating. Although there were points where I wanted to scream at her it actually seemed to work out that she did the right thing. She’s so driven by passion. A very fierce way to live. Oh Kiran, I loved him. He is such a kind hearted soul plus I don’t know I guess a bit daring. I really loved his interactions and Aya and his way of settling her down. When she gets fired up he is there to stifle some of the flames to help her make smart decisions. I really mean that the plot is both terrifying and riveting. I was fascinated by how Aya could possibly get out of her situation. She has failed attempts. Lots of failed attempts but she never gives up. The book is divided into sections chronically from when Aya is captured. The thing about the book is that it is solely about Aya and her struggle to be free. It’s not about fixing a broken society or taking it upon herself to save the world. I liked the approach. Definitely different. I really liked the book and felt like it’s unique dystopia. If you are looking for something a little different, I think you will find yourself captivated by Aya’s story as well. Thanks for having me! Happy listening, and even happier reading! Thank you so much for this giveaway! 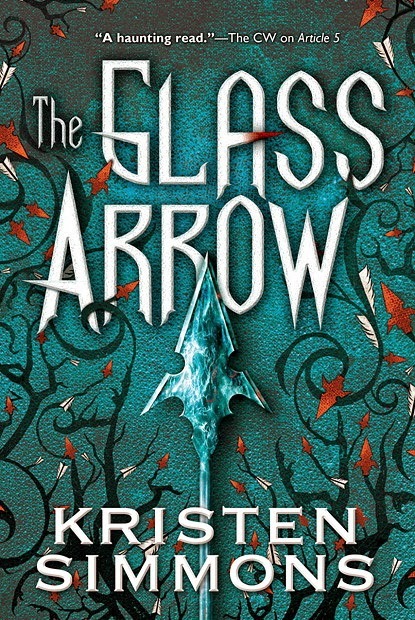 I've heard The Glass Arrow is fantastic! What's the direct Spotify link to the playlist?